We come together at every level, and as a community, we are here to be of service to you. We start with listening and together with you, we have the resources, expertise and experience to find solutions and new ways to every challenge. 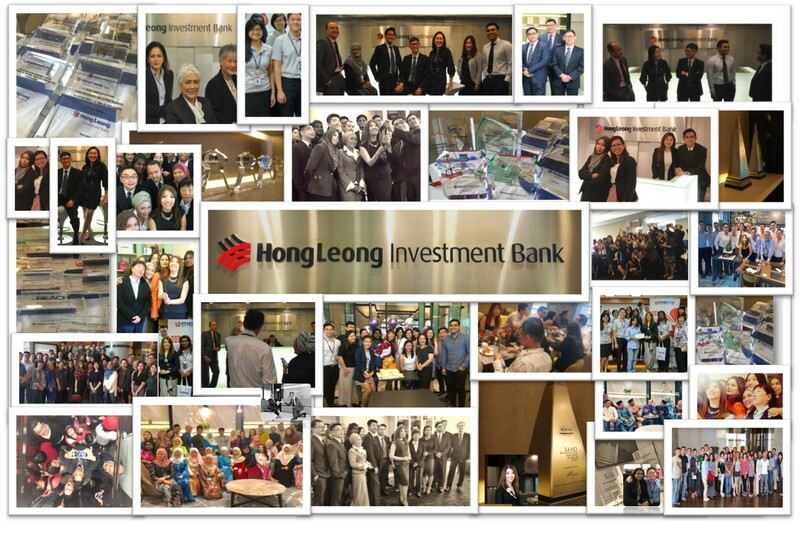 Hong Leong Investment Bank (HLIB ) is wholly owned by Hong Leong Capital Berhad which forms part of the stable of well established and successful companies located in many countries which are spearheaded by our Chairman, Yang Berbahagia Tan Sri Quek Leng Chan.Our main areas of operations are in Investment Banking & Stockbroking. The first step in our journey was in 2009 when we were licensed as an Investment Bank. Then in early 2010, our Management Team and all our pioneering colleagues, under Miss Lee Jim Leng came together and through working at giving our best,we were awarded The Best Investment Bank in Malaysia for year 2013 by WORLD FINANCE. The core activities of the Investment Banking Division include arranging and managing debt and equity fund raising, private debt securities ("PDS") issuances, syndicated loans, initial public offerings ("IPOs"), rights issues, restricted issues, special issues and private placements. Other corporate-related advisory works include corporate restructuring, mergers and acquisitions, asset and investment valuation, takeovers and privatisations and capital market instruments. At the same time, the Bank also offers debt and equity underwriting, deposit taking, treasury-related solutions as well as trading and distribution. The Stockbroking Division under the name of HLE BROKING provides a range of broking services for a wide range of clients ranging from institutional to high net worth and retail investors. Supported by a dedicated client centric sales team that is committed to providing timely advice and good trade execution as well as a research team that is headed by a rated analyst and other professionals who are industry specialists, HLE Broking strives to deliver groundbreaking insights and fresh perspectives on investing ideas. In addition, the Stockbroking division focuses in investing into building its electronic online trading platform to provide an enhanced customer experience with competitive trading pricing. We comprise a team of experienced and dedicated individuals all trained to offer retail and institutional stockbroking services, equity research, margin financing, nominees and custody services and futures & options broking services. In an organization as important as an Investment Bank, it is its people, recognising their own strengths and differences and having the will to work together that will allow them and what they represent to scale greater heights. We have done just that together and we proudly recognise ourselves as HLIB. We believe in empowering people by bringing together dynamic elements such our youths , culture and diversity. Clients Coverage consists of a team of senior experienced investment bankers focusing on deal origination by understanding the clients’ financing needs and offering value-added financing solutions and products to our clients. They are the main business drivers for the Investment Banking Division. The Debt Markets teams are involved in the offering of its services in the fund-raising exercises via the debt capital markets or syndicated loan markets. Products include the issuance of private debt securities (bonds, medium term notes, commercial papers), asset-backed securities, equity-linked products convertible bonds, bonds with warrants), bridging loans, bank guarantee, revolving credit facilities and mezzanine financing. The team also offers agency services by undertaking the role of facility agent and/or security agent and/or issuing agent for the debt products. Corporate valuations, underwriting, corporate and debt restructuring and independent advice. The Treasury and Markets teams provide asset and liability management services to clients mainly in terms of analysing and structuring foreign exchange and interest rate hedging, in addition to trading and distribution of fixed income instruments. We proudly present to you all our various achievements, many of which are firsts in the Malaysian Investment Banking industry. Further glimpses of us. We are constantly looking for new candidates to join our HLIB family. For more infomation regarding career opportunities, please contact us via recruitment@hlib.hongleong.com.my. From ALL of us, thank you for taking this time to let us show you our website. Please do contact us if you have any inquiries. TOGETHER, we are here to give you our best. © HLeBroking. All Rights Reserved.